Published Jul 19, 2016 By Julia 3 CommentsThis post may contain affiliate links. Imagine your favorite sushi roll (California roll? Tuna roll? Dynamite roll?) — in a bowl. Almost everything tastes better in bowl form (think burritos) and sushi is no exception. 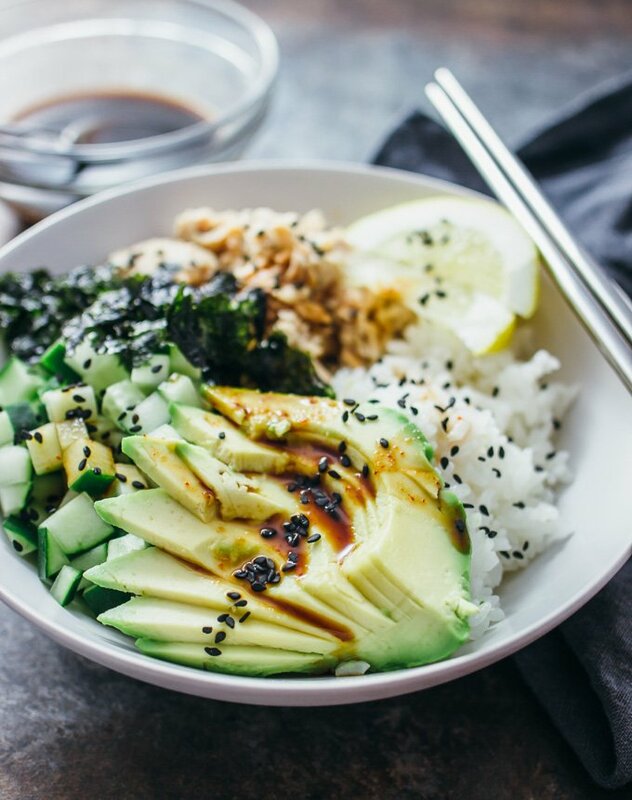 This delicious sushi bowl recipe includes salmon, sliced avocado, diced cucumber, crumbled seaweed, and toasted sesame seeds. Best yet, there’s an easy-to-make spicy dressing made of soy sauce, sriracha, and a hint of lemon. I’m too lazy to make my own sushi. When I was a kid, my mom would make homemade sushi and it was fun to see how it was made, but it was always a lot of work! Nowadays I’ll always go out for sushi. But sometimes I have sushi cravings and the local sushi restaurant is closed. 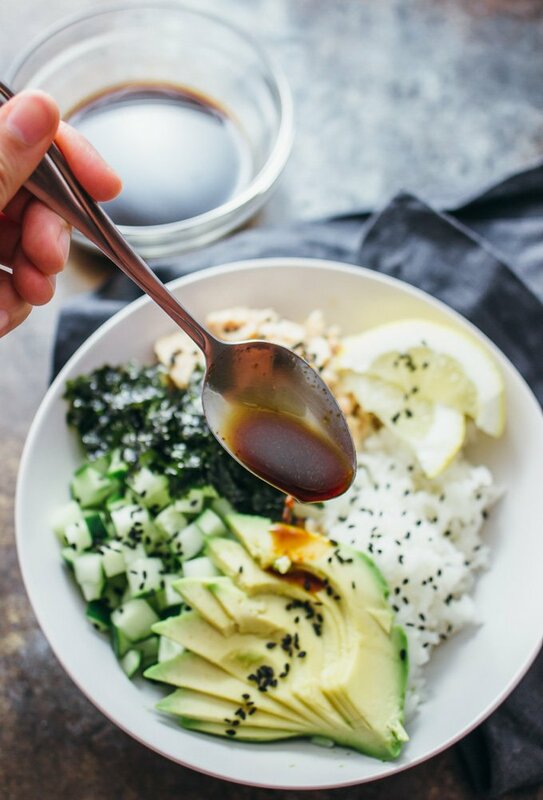 That’s when I bust out this fast 30-minute sushi bowl — toss in your favorite sushi toppings over sushi rice and drizzle some spicy dressing and you are all set. What do I mean by sushi rice? I like to make my sushi rice by tossing cooked medium-grain white rice with some rice vinegar and some salt. I love this extra added flavor for the rice. I’m a big fan of this sauce/dressing. It’s simple (mainly soy sauce) and spicy (sriracha) and slightly tangy (lemon juice). Win-win-win, right? This recipe is really versatile. It’s easy to swap ingredients in and out. I would recommend keeping the sushi rice and dressing ingredients without modifications, and swap out toppings as preferred. Want a California roll sushi bowl? No problem — use imitation crab instead of salmon. Have different vegetables on hand? Feel free to use them instead! Another good thing about this recipe: it’s no-cook and perfect for light summer meals when you don’t feel like heating up your kitchen by using the oven or the stove. Just toss everything together in a bowl and you are done. ? Right now I’m all about summer salads. Some of my favorites include this insanely good pasta salad and a southwest cous cous salad. 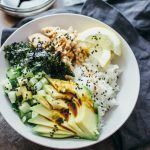 This delicious sushi bowl recipe includes salmon, sliced avocado, diced cucumber, crumbled seaweed, and toasted sesame seeds. Best yet, there’s an easy-to-make spicy dressing made of soy sauce, sriracha, and a hint of lemon. Sushi rice: Using a mixing bowl, mix the cooked rice with rice vinegar and salt. Divide the rice between two bowls for serving. Assembling: Add salmon, avocado, cucumber, and seaweed to the two bowls. Sprinkle sesame seeds on top. Dressing: Mix all of the dressing ingredients in a small mixing bowl. Pour over the bowls or leave the dressing on the side. I love everything about this except using sriracha in the dressing. This is sushi, you should use use wasabi! I just don’t care for sriracha. This sounds amazing! Just sent the link to my husband (he does most of the cooking in our house lol). So glad to stumble upon your blog! Beautiful pictures!! And this sushi bowl is time saver!! Loving it! !